I need a help on my network card. I have a Acer V3-571G with Broadcom NetLink Gigabit Ethernet. I am running Windows 10 Single Language Edition. For an unknown reason, Windows keeps dropping my connection with the network card. For no reason it disconnects the card and goes to wireless connection. When I was using windows 8.1, this didn't happen. Also I ran Ubuntu Linux for a while to see it the problem would occur, but it didn't. When this problem happens, I need to disable and enable the network card so it can start working again. Couldn't upgrade or downgrade the network card driver because win 10 won't allow it. If I do so, windows will fallback to it's original driver. Microsoft could correct this issue, since it seems a driver problem. The network is operational because when using linux or windows 8.1 the problem doesn't happen. Is there a way to stop windows to upgrade or changing the network driver? What could be other solutions? Type Device manager in the Search Bar and select the Device Manager from the search result (and Run as administrator). From the right pane, expand the Network Adapters tree. 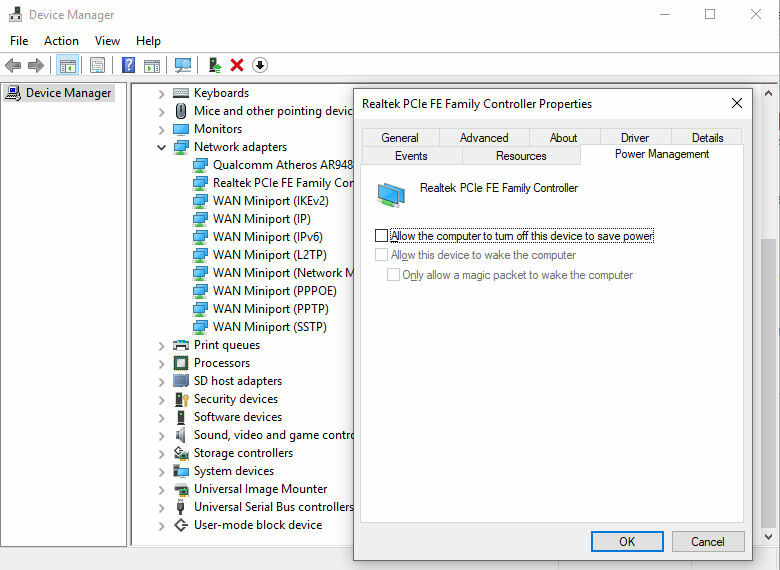 From the displayed list, right-click the network adapter that you are using to connect to the network/Internet and are facing trouble. From the context menu that appears, click Properties. On the opened NIC’s properties box, go to the Power Management tab. From the displayed interface, uncheck the Allow the computer to turn off this device to save power checkbox. Once done, click OK to save the changes that you have made. If this NIC (Network Interface Card) problem persists, have a look at Troubleshooting network problems in Windows 10.